Rich, opulent, and seamlessly structured, 2014 RC Syrah exemplifies the superlative nature of what can be realized from the Inglenook Estate in an outstanding vintage. From its opaque, inky color to a beautifully textured palate, the efforts to learn the intricacies of each vineyard block and what they are capable of, craft a structured wine while retaining freshness. An alluring nose of violets, red pepper, wild berries, and forest fruits is punctuated by more sensuous notes of leather, nutmeg, and chocolate. Intricate and intense, the lush, juicy fruit typical of this wine offers a briary, gamey characteristic. Round upon entry, the expressions are incredibly generous and persistent on the finish. Fine powdery tannins and oak are well blended, creating a masterful integration of flavors and aromatics. 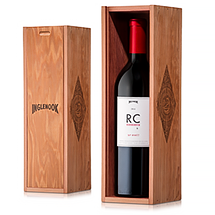 These limited production single bottle boxes are locally crafted using reclaimed coastal California Redwood previously used as large wine casks in Sonoma Valley around the turn of the century. Due to the unusual material used, each box has a special unique appearance alll of its own, no two boxes are the same. The rustic classic appearance of the redwood paired with wine stains from years of aging combine together to allow a one of a kind presentation. The box is fire branded with the Inglenook logo. Box and wine ship separately.